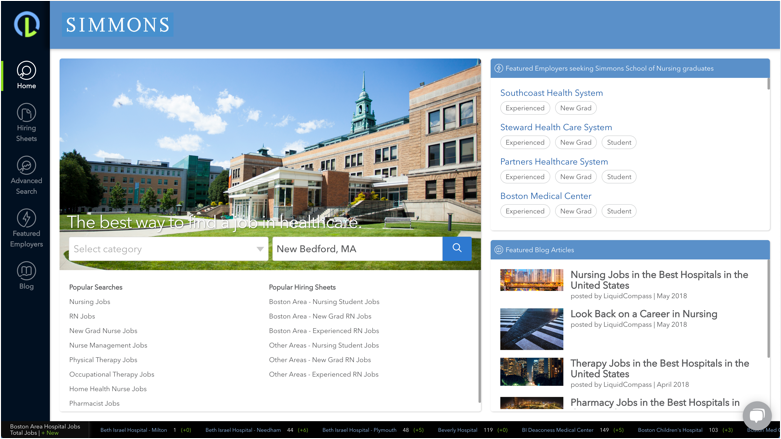 Give your students and alumni one-stop for all jobs in healthcare, with a site branded and customized for your school. Help your new grads and alumni find the right jobs with ease. Job search should be like a great shopping experience. That's what LiquidCompass delivers - all the selection and filters you need in one place to find the right healthcare jobs, right away. We help your your new grads and alumni focus on pursuing the right job, instead of wasting their valuable time trying to identify jobs at lots of different places. Get a free custom site, branded just for your school. We build it and host it, but your branded site is a resource for you to provide to your students and alumni to access the LiquidCompass job search. You choose the logo, imagery, colors and custom job search elements. Hundreds of schools across the US already have one, because it works really well! Hiring Sheets. Jobs for students and new grads, with a single click. Jobs for students and new grads can be really hard to find. Keywords on search engines return too many false positives and job boards don’t often post the jobs. We use our data intelligence engine to isolate the jobs for students and new grads. Then, we make them easy to find using precise filters. 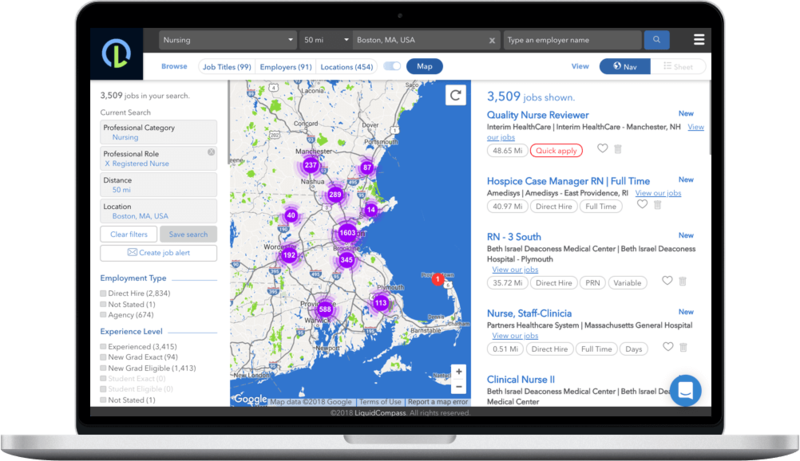 Track nurse hiring demand and trends for virtually every specialty, care environment, employer, and market in the U.S.
Gain valuable market insights to identify opportunities for clinical program expansion based on employer hiring trends and requirements. Provide sophisticated, data-driven career guidance to students, new graduates, and alumni. Identify and track education requirements, licensure requirements, and skills requirements by specialty, market, and employer. Knowing the hiring market has never been easier. Great data makes the difference. Indexed for what matters in healthcare. We collect every job posting from nearly every healthcare employer each day. To be certain they’re clean and not duplicated, we get postings directly from each employer’s career site. Then, we thoroughly index them for all the things that matter in healthcare. 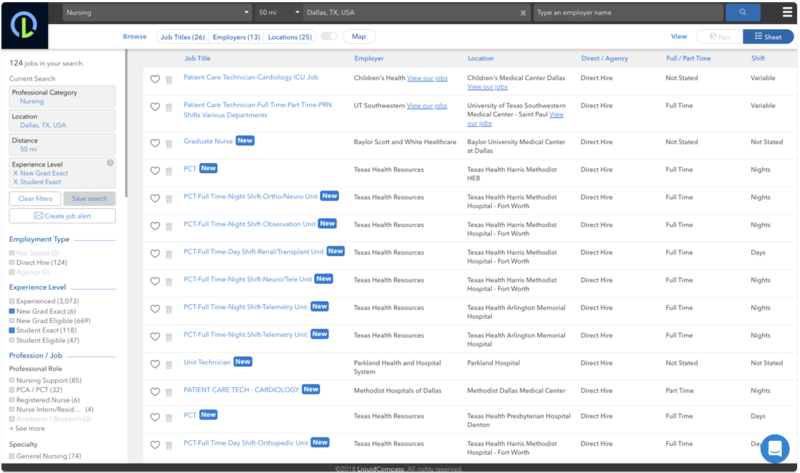 With complete indexing, we set the necessary foundation for our unparalleled healthcare job shopping experience and hiring market analytics tools . Already used by hundreds of schools you know. Get your site to gear up for your next incoming class. LiquidCompass is an amazing resource that our students and new grads use first when looking for a job. Our students think I’m a rock-star. It’s all thanks to LiquidCompass. ©2018 LiquidCompass. All rights reserved.